Most frequently picked-up item: Plastic nightcrawler containers. I know, you were all hoping for cans of corn, maybe next month! We got to Happy Hollow at about 7:30 Saturday morning, and needless to say there was plenty of trash just laying in the parking lot to keep us busy for a while. The water was up of course, and we could only see one boat upstream of the ramp. No one showed up to fish the banks until about 8:30. We decided to start with the hardest part first, the hillside in front of the parking lot. It is really amazing the things that you find in a cleanup. Not to mention the amount of things that can be recycled. A ton of glass bottles came out of the woods, some that have been there for decades, we probably could sell some to antique stores. We will have to look into that next time. Cans were quite a popular item too, and the giant contractor bag that we have full of them will be recycled this week. Beyond that, it was a regular wal-mart on the hillside. Fishing line, candy wrappers, plastic bags, socks, cigarette packs, dip cans, and yes, the occasional diaper. We covered all the bases on all your domestic beer cans and bottles, I thought we were cleaning up a fraternity house after a brutal party. We also found a lot of wire mesh and rubber that we had to dig out of the ground after years of erosion. Big chunks of metal to be recycled and cashed in to benefit our veterans! 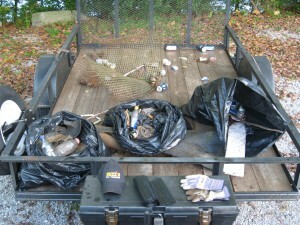 Within the first two hours we had enough trash to fill the truckbed and a growing pile of recyclables on the trailer. Once we had the main hillside straightened up, we started on the other side of the ramp following the trails down to the feeder creek. With the water being high and fall upon us, there were plenty of nice browns moving around in the creek to spawn, and some fishermen were in there working them. It was good to see the solid fish that we did, and especially good to see how stingy they were being. The whole time we were there we only saw one fish caught, a very nice fish that went about 22 inches. Other than that, no one was having any luck from the bank. Once we had the trailer filled up with beer cans, bottles, and plastic nightcrawler cans, we bagged everything up and headed for the dam to knock out a casting lesson and get Gav acclimated with a fly rod. The new parking lot up there is enormous, and I’m sure that it wont take long for it to be filled up on the weekends, but as long as it’s full of anglers who abide by the regulations and don’t trash the river, I should be fine with that. Gav took to casting much easier than most people, it was just easy for him to pick up, he just needed the particulars of the cast, and end of story. From now on the casting practice he gets will be casting to fish on float trips and wading in low water. Another fly fisherman is born on a bright October day, helping to clean up the river and learning to cast, all in the same day. Oh and in case anyone was wondering, we did not find one leader packet, floatant bottle, or tippet spool in the course of the cleanup at Happy Hollow. Also, it still says “No littering” on the sign as you pull into the parking lot. In case anyone is confused or knows anyone that is, that means that you should leave with whatever you came with instead of throwing it on the ground. 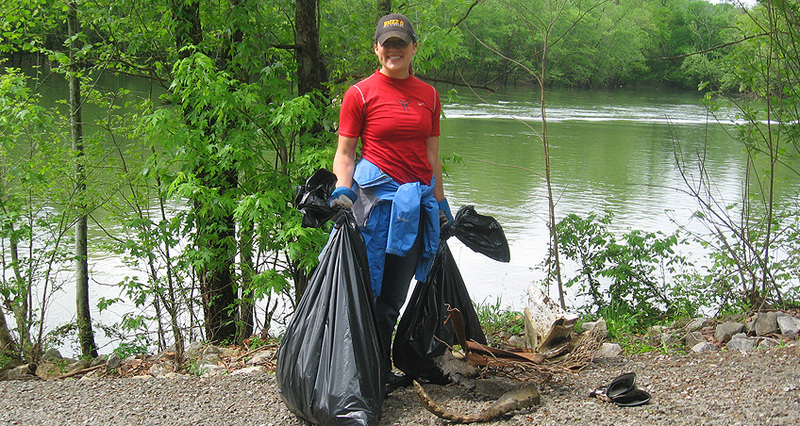 We were able to pick so much up with just two guys, just imagine what will happen as our numbers grow with each cleanup. Remember, leave the resource cleaner than you find it and you are making a difference.